What do you mean 2015 is drawing to a close??? 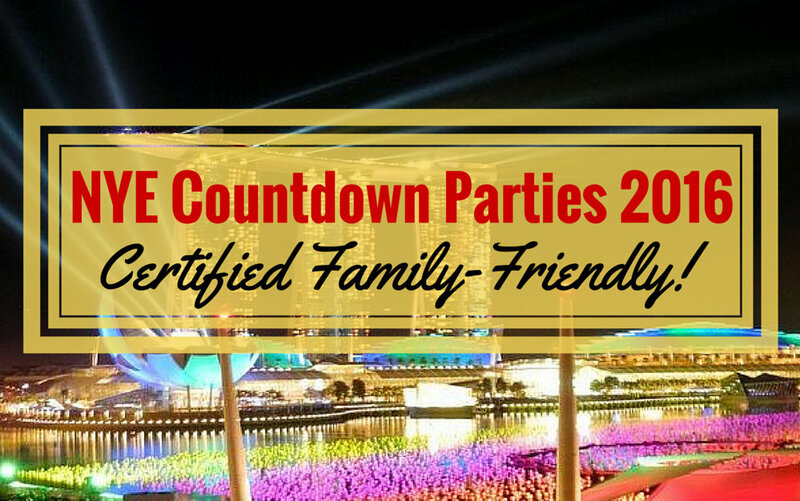 Never mind the resolutions - if you are looking for the perfect way to end 2015 on a high with the family, I have got the scoop on some of the most happening New Year's Eve Countdown Parties across Singapore on 31 December 2015. And best of all, I have marked out those that are certified FAMILY-FRIENDLY! So grab your family members, and get ready to revel in the festivities and ring in 2016 in style! 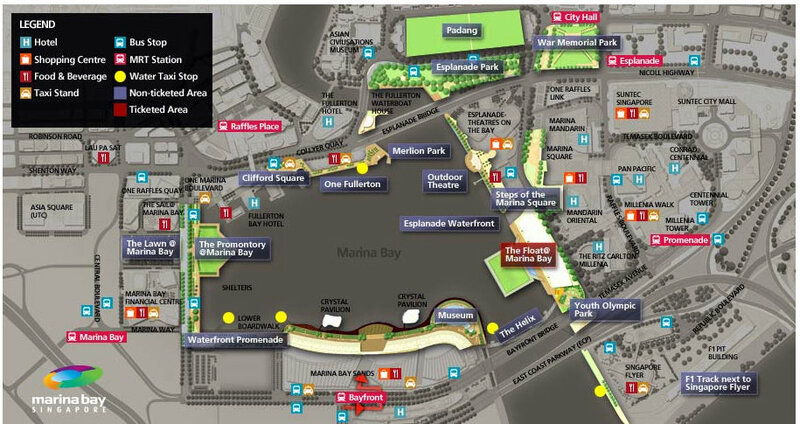 The largest Countdown celebration in Singapore, the Marina Bay Singapore Countdown is THE countdown event to head down to for the sheer amount of fringe activities, brilliant light-up of the wishing spheres against the Marina Bay backdrop and of course, its 8-minute long Fireworks display! Celebrate a Jubilee year well spent amidst 20,000 wishing spheres bearing collective hopes and dreams for the year ahead. Matching 2015's display, the pyrotechnics to usher in 2016 will last eight minutes with festive lighting of buildings around the Bay and a special light projection show on the facade of The Fullerton Hotel. The façade of the Fullerton Hotel comes alive with light and colour with a digital art showcase that looks ahead into a vibrant, dynamic new year. This show combines vivid imagery and intricate textures to highlight the architectural features of this national landmark and evoke a sense of beauty and grandeur. The display will culminate in a spectacular countdown sequence on New Year’s Eve. Celebrate December invites you to share in the festive cheer in a month of joy and happiness! As the saying goes, a joy that is shared is a joy made double. So join us at Esplanade with your family, friends and loves ones, and be enthralled by a myriad of free programmes including music performances, roving acts, craft workshops and more that culminates in a spectacular New Year’s Eve countdown at Marina Bay. There’s something for everyone, so make merry with us and lift your spirits through the arts! Set amidst the celebratory atmosphere and the most spectacular fireworks display in Singapore, the Marina Waterfront Bazaar promises a unique and fulfilling shopping experience for everyone. An indulgent array of artisan handicrafts, collectibles, fashion apparel and accessories, party novelties and lighted gadgets is on offer, with light refreshments also available at affordable prices. 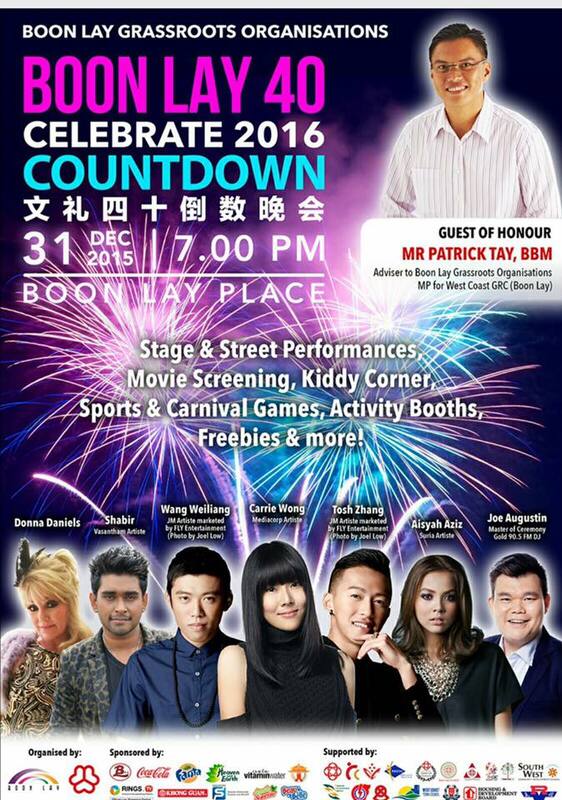 To mark the end of SG50 and the beginning of a new era, MediaCorp is proud to present the biggest countdown event of the year, Celebrate 2016. Featuring a star-studded ensemble of local artistes as well as international superstar Adam Lambert, Celebrate 2016 will be a night of exhilarating performances, packed with excitement and great entertainment. 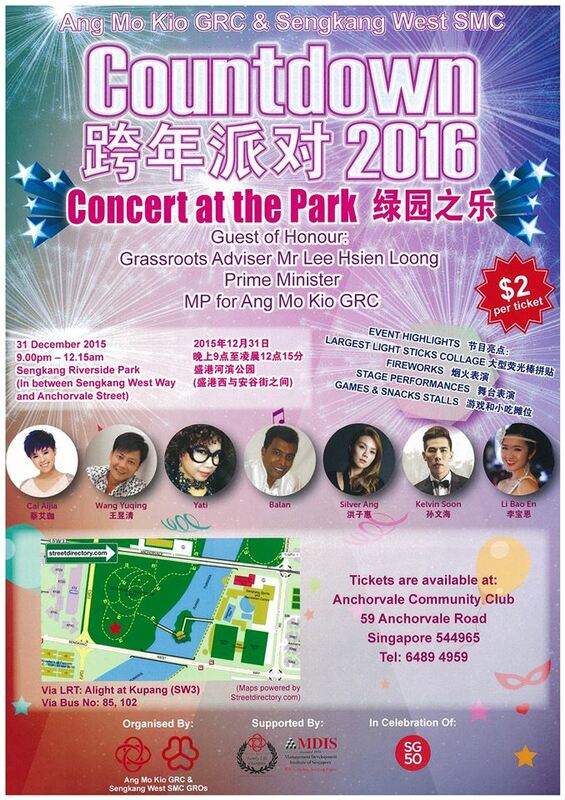 Price: $168, $88, $38 | For tickets, click HERE. 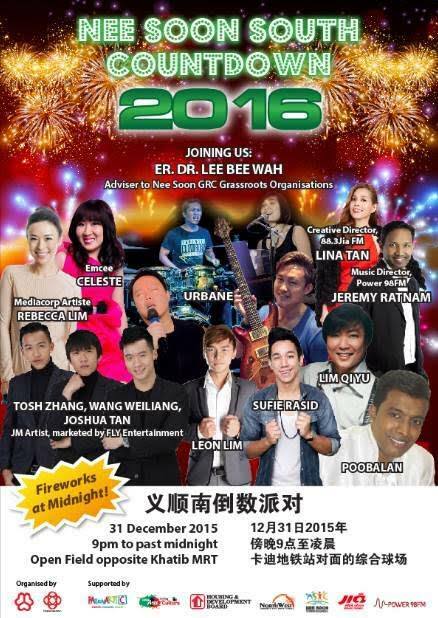 Other for the fact that the rides are OPEN ALL NIGHT, expect the New Year’s Eve party at Universal Studios Singapore to hit fever pitch with LED street acts and shows, a tribute band performing hits of Jessie J and, pyrotechnics and multimedia shows! 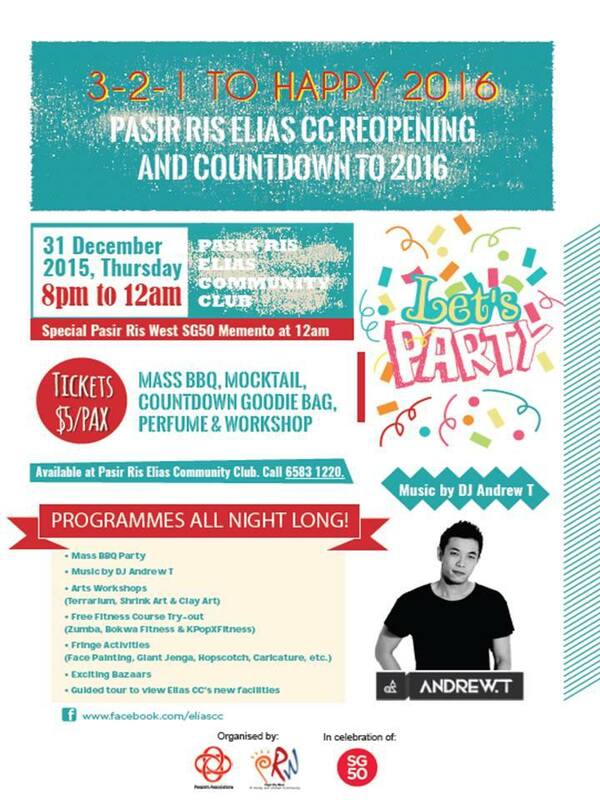 It's a New Year's Eve party you wouldn't want to miss! 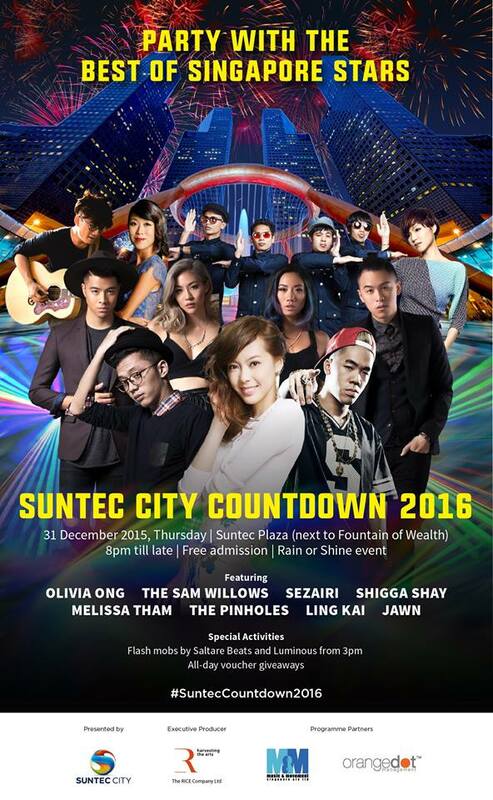 Usher in 2016 at Suntec Countdown 2016 and enjoy great Singapore music by Olivia Ong, The Sam Willows, Sezairi, ShiGGa Shay, THE PINHOLES, Ling Kai Music 铃凯, JAWN and Melissa Tham. What's more, it's all FREE! 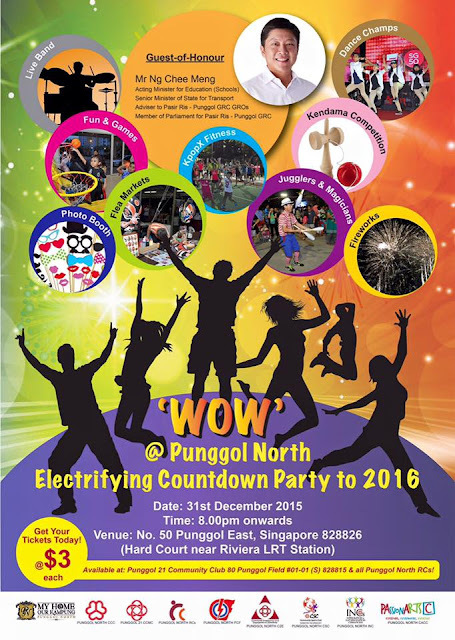 Get soaked in foam for a 3 hours skating session and enjoy a FOAM PARTY COUNTDOWN as we march into 2016! You are wanted by the Ringmaster! 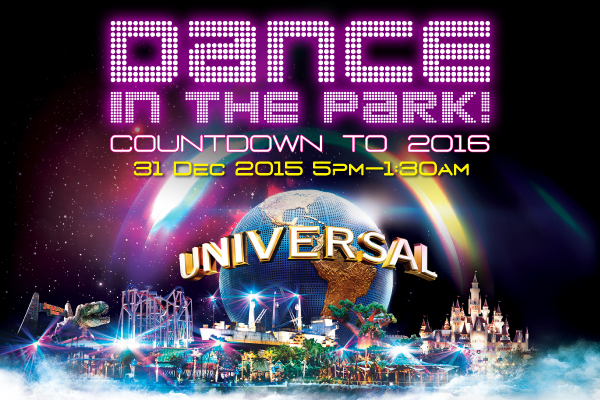 Expect a Countdown Party like never before as we bid goodbye to 2015 and welcome 2016! 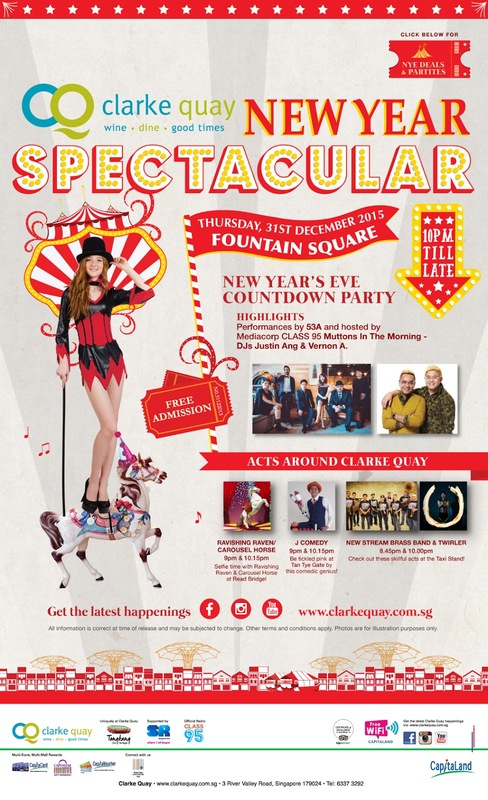 This Circus-themed Countdown Party in Clarke Quay will get you grooving all night long. Play exciting stage games with hosts MediaCorp CLASS 95 Muttons In The Morning - DJs Justin Ang & Vernon A as they bring the night to a new high with their witty banter along with energetic stage shows and electrifying music performances by popular local band, 53A. 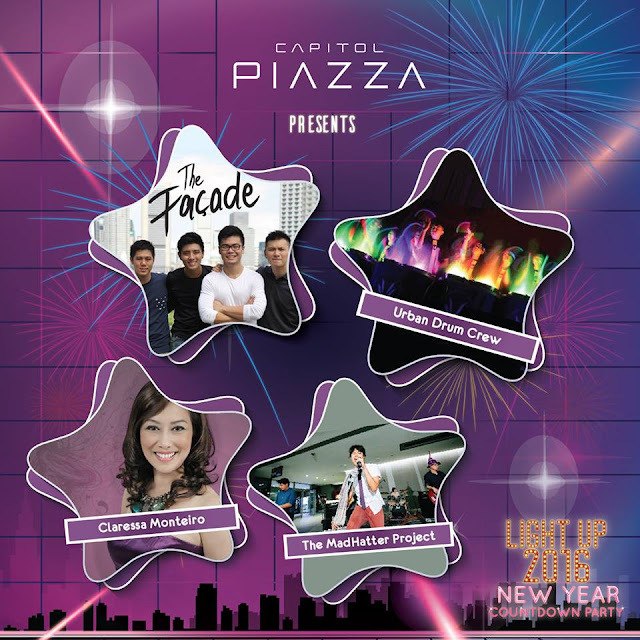 Head down to Capitol Piazza for its Light Up 2016 countdown party, and catch a light percussion act as well as local musicians Urban Drum Crew, The Façade, The MadHatter Project, Claressa Monteiro & Band! In between, win prizes in the stage games and giveaways, and eat, drink, and make merry at the party booths. The fun begins at the Capitol Outdoor Plaza at 9pm! 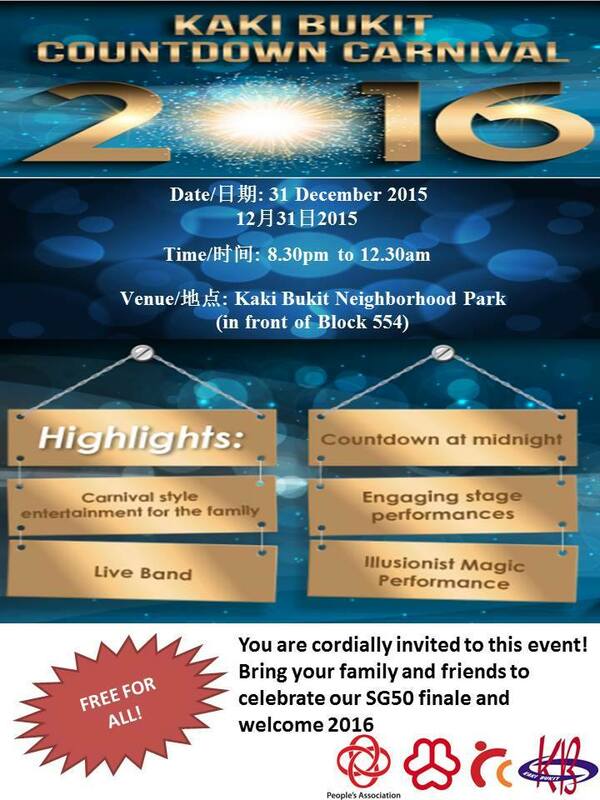 Thinking about how to Bid Goodbye to 2015 and Welcome 2016 with your friends and family? 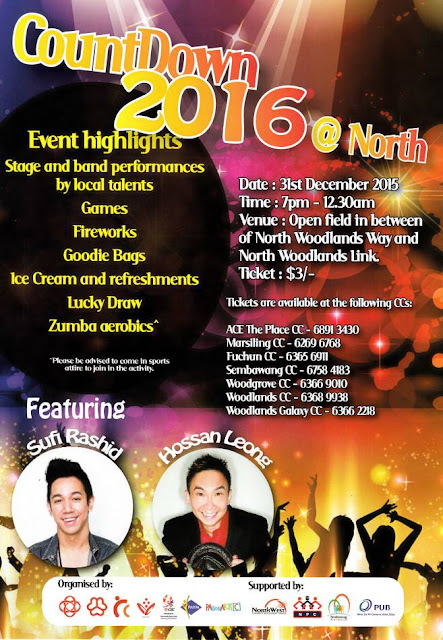 This is your PARTY and a Family friendly Event with Bollywood theme! Bring on your mask for more fun with features including Bollywood DJ Music, Dholi, Variety programs, Karaoke, food, drinks and dance. 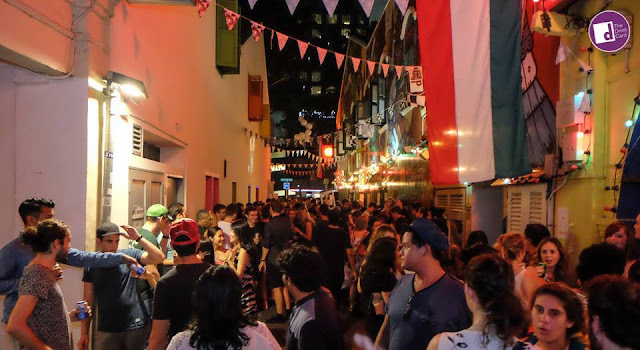 Get jostled around as Mexican restaurant Pieda Negra heads this alleyway party with beef tortillas, pineapple margaritas and old school funk, reggae and R&B by DJ Jag. The Lookout offers some of the best seats in the house for those looking to ring in the new year with great city views and a dazzling fireworks display! Choose between lounging on hammocks at the premium alfresco section, or form a party of up to 4 and enjoy the views round a table. 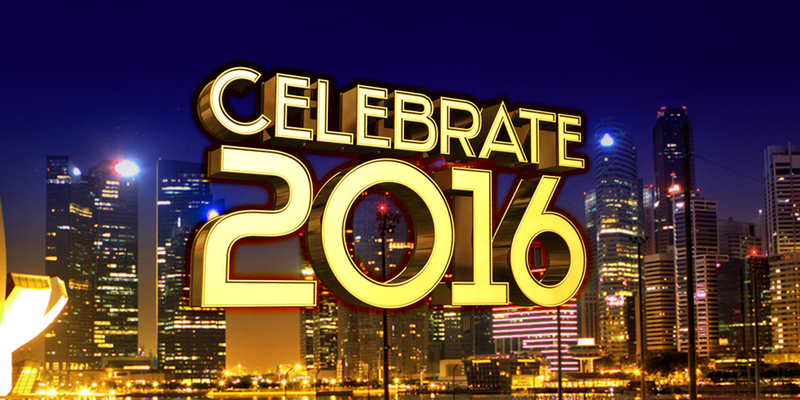 Indulge in chilled ciders, special party snacks and music with us as 2016 beckons! 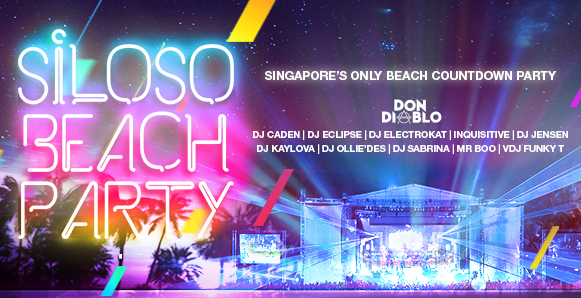 Each guest will receive a complimentary party pack with a bottle of cider and party snacks upon entry to the event. Have your private countdown party in the sky with delicious platter, champagne while you relish the sensational display of fireworks at the stroke of midnight. This year, the cabins are decked up in festive decorations, upping the joyous mood a notch. 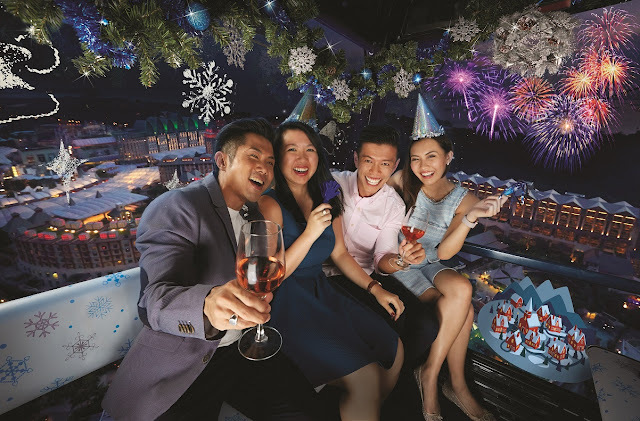 At $488++ per cabin (up to 6 guests), enjoy, 2 bottles of Champagne, 3 round trips (10.30pm – 12.30am) on the Mount Faber Line, Opportunity for a close-up view of fireworks display during countdown, Sweet Chocolate Treat Platter and Party packs. For more information, visit www.faberpeaksingapore.com/promotions/happiness-peaks-all-december.